Objective: Direct exposure of the nucleus to radiation, is the primary cause of various radiobiological effects. However, the cytoplasm is equally exposed to radiation during treatments that result in activation of intracellular response. Thus, the present study is aimed at investigating (1) whether cytoplasmic irradiation affects double-strand breaks (DSBs) repair when the cytoplasm (C) and nucleus (N) is irradiated sequentially, and (2) whether the cytoplasmic irradiation alone is sufficient to induce DNA DSBs in the nucleus. Materials and Methods: To distinguish the radiobiological effects between nuclear and cytoplasmic irradiation, all the experiments were conducted using the SPICE - National Institute of Radiological Sciences microbeam (SPICE) that can target precisely the N and/or C with desired number of 3.4 MeV protons. We examined the kinetics of DSB repair in WI-38 normal human fibroblast cells that were irradiated by microbeam targeted to the N, C, or N + C. Cells were fixed at various time points between 1 and 24 h postirradiation. Subsequently, they were immunostained with antibodies against γ-H2AX, a DSB marker, and imaged, to quantify the residual DSB in each nucleus. Results: Microbeam irradiation induced significant γ-H2AX, directly proportional to the number of protons delivered per N. In the C-targeted cells, γ-H2AX levels did not increase significantly, compared to controls, 1-h postirradiation. However, 4-h postirradiation, γ-H2AX levels were significantly increased in C-targeted cells, compared to nonirradiated controls, and the increase was proportional to the number of protons delivered. Cells irradiated with 500 protons per N, showed lowered residual γ-H2AX levels in N + C cells additionally irradiated with 500 or 1000 protons targeted to the C, 16 and 24 h postirradiation, respectively. Conclusion: Our results suggest that cytoplasmic damage triggers enhanced repair of DSBs that are induced on nucleus irradiation. In classical radiation biology, it is described, that DNA damage, induced directly by deposition of energy by radiation, is the main cause for various radiobiological consequences. DNA is considered to be the primary target of radiation. However, in the past several decades, many phenomena were reported, that cannot be explained by this classical dogma.,, For example, Wu et al. showed a higher frequency of mutations, than the frequency of nucleus targeted cells, when compared at the same 90% survival rate, indicating that processes other than direct DNA damage may have triggered a mutation in these cells. These findings indicated the existence of non-DNA/secondary targets, that may determine the fate of irradiated and nearby nonirradiated cells.,, One such candidate for the secondary target could be mitochondria, as mitochondrial biogenesis plays an important role in the radiation-induced cellular response.,, Further, Richardson and Harper showed that mitochondria, rather than the nucleus, are important targets for radiotherapeutic effects, in oxygenated tumor and normal cells exposed to low linear energy transfer (LET) radiation. Hence, mitochondria is potentially the non-DNA/secondary target that may be activated by direct deposition of energy in the cytoplasm. Microbeam technology is an effective method to answer questions such as – what is the non-DNA/secondary target of radiation and how does it cross-talk with damages to the primary target, as this technology allows one to precisely investigate the effect of damage response in cell nucleus or cytoplasm or both, at a micrometer resolution., Based on the microbeam technology, many studies have reported defensive cellular responses triggered by radiation-induced cytoplasmic damage that reduced radiobiological effects and increased cell survival rate. For example, Maeda et al. compared the cell survival rate of nucleus-targeted cells and entirely irradiated cells, using monochromatic X-ray microbeam. They reported that cells targeted only in the nucleus showed a lower survival rate compared to that of cells irradiated entirely. In other words, they suggested the existence of intracellular signaling that induced repair-related factors, to control radiosensitivity. Tartier et al. only irradiated the cytoplasm with alpha particles and found foci formation of the DNA double-strand break binding protein p53 binding protein 1 (53BP1) in the nucleus. This indicated that cytoplasmic damage triggers activation of double-strand breaks (DSBs) repair. Furthermore, Wu et al. described that cytoplasmic damage induced a sustained increase in the expression of glycolytic enzymes, characteristic of radioresistant malignant cells. However, the dose dependency of the biological effect of radiation-induced cytoplasmic damage, and the efficacy of cytoplasmic damage-derived defensive signals, to DNA damage repair in the nucleus, are yet to be clarified. In this paper, we described the methods for targeted irradiated of nucleus, cytoplasm and both nucleus/cytoplasm, using the Single-Particle Irradiation system to cell National Institute of Radiological Sciences (SPICE-NIRS microbeam),, which delivers 3.4 MeV proton microbeams, 2 μm in diameter, with precise dose control and targeting accuracy to target the cells. The dose-dependent induction of γ-H2AX, a marker for DNA DSBs, were measured for all the three target conditions, microbeam targeted to the nucleus, cytoplasm, or both, for up to 24 h postirradiation, to elucidate the effects of cytoplasmic damage on DSB repair in the nucleus. WI38 human normal lung fibroblast cell line (RCB0702) was obtained from the RIKEN Bioresource Center. The cells were maintained in Dulbecco's modified Eagle's medium (Wako Pure Chemical Industries Ltd., Osaka, Japan) supplemented with 10% fetal bovine serum, 2 mmol/L L-glutamine and antibiotics (100 units/mL penicillin and 100 μg/mL streptomycin) at 37°C in a 5% CO2 and humidified atmosphere. Briefly, cell nuclei were fluorescently stained by adding 1 μM Hoechst 33342 in the cell culture media, 30 min before the microbeam irradiation. Fluorescent images of the cell nuclei were obtained by the SPICE online microscope system installed above the beam exit window. The microscope was equipped with a 10× objective lens (UPLFN 10×, NA0.3, Olympus Co, Japan), and a CMOS camera (ORCA-Flash 2.0, Hamamatsu Photonics, Japan) with fast motion voice-coiled motorized sample stage (Techno-hands Co., Ltd., Japan). Microbeam targeting of the cell nuclei and cytoplasm are also described elsewhere. In this study, positions of WI-38 cells recognized in the 1654 μm × 827 μm images were calculated according to the obtained fluorescent images, and positions of the cell nuclei were output as (Xn, Yn) coordinates representing the center of the nucleus, according to the ellipse approximation. As shown in [Figure 1], microbeam is delivered to (Xn, Yn) for nucleus targeted irradiation. For cytoplasm irradiation, two positions were targeted per cells, (Xc1, Yc1) and (Xc2, Yc2), which offset distance d μm from the (Xn, Yn) in the major axis direction. The “d” is defined for each cell type, and cell culture condition, and for WI-38 cells was set at d = 13 μm. For nucleus and cytoplasm irradiation, (Xn, Yn), (Xc1, Yc1), and (Xc2, Yc2) were irradiated in each cell. Then, the number of protons was set to be delivered to each X-Y coordinate within the cells. SPICE delivers protons beam with an intensity of 104 protons per se cond and can irradiate 360–480 positions per minutes. Irradiation of cell dish with 500–1000 cells was completed within 10 min. After microbeam irradiation at 1, 4, 8, 16, and 24 h, cells were washed twice with ice cold PBS and fixed with 4% paraformaldehyde in PBS at room temperature for 10 min. Cells were then permeabilized, blocked with 5% goat serum and 0.1% Triton-X in PBS for 1 h at room temperature and incubated with anti-γ-H2AX primary antibody (anti-Phospho-Histone H2A. X (Ser139) Antibody, clone JBW301, Merck Millipore Co, Germany) diluted in antibody solution (1% BSA, 0.5% Triton-X in PBS) (1:500) at 4°C overnight, followed by secondary antibody (goat anti-Mouse IgG [H + L] Secondary Antibody, Alexa Fluor 488, R37120, Thermo Fisher Scientific) diluted to 1:500 in antibody solution and incubated at room temperature for 2 h. Cells were washed twice with PBS between each step, and the nuclei were then counterstained with 1 μM Hoechst 33342 in PBS for 30 min at room temperature before the images were visualized. Fluorescent images of immunostained cells were obtained by the SPICE-offline microscope system, which duplicates the SPICE on-line microscopic system installed above the beam line. Detailed procedures of image acquisition and image analysis are previously described. Briefly, the off-line microscope was equipped with a 40× water immersion objective lens (LUMPLFLN-W 40× W, NA: 0.8, Olympus Co., Japan) and a C-MOS camera. A mercury lamp (130W, U-HGLGPS, Olympus, Co) was used as a light source. In this study, filter sets for Hoechst 33342 were U-MNUA2, and AlexaFluor 488 was U-MGFPHQ. All mirror units were purchased from Olympus Co, Japan. A total of 32 images, consisting of 8 × 4 images captured in the X-Y direction, with individual image sizes of 207 μm × 207 μm, were obtained for the targeted area. These were separately tiled and combined into a single image of 1654 μm × 827 μm for each channel. All images were analyzed by Image J software (64 bit). Two-tailed fluorescent images representing (1) all nuclei counterstained with Hoechst 33,342, and (2) fluorescently stained γ-H2AX with Alexa Fluor 488, were imported into Image J software (https://imagej.nih.gov/ij/) as an image sequence, to analyze each fluorescence with identical cells per unit area. Images of the cell nuclei were determined according to Hoechst 33342 fluorescence by interactively setting lower threshold values to distinguish nuclei from the background. By using plug-in software “nucleus counter,” all cell nuclei in the tiled Hoechst 33342 images were extracted as the region of interest (ROI), which was used to output corresponding information, such as X-Y coordinates, area size, and mean fluorescence intensity per pixel. The information of coordinates and area sizes of ROIs were sequentially used to analyze the tiled AlexaFluor488 images, resulting in a set of data indicating the fluorescence intensity of Hoechst and Alexa Fluor 488 for each cell in the individual image. Finally, the AlexaFluor 488 fluorescence per nucleus was averaged, which comprised over 200 cells per category. Averaged γ-H2AX fluorescence per nucleus for each time point was normalized against the nonirradiated controls, which were also prepared for each time point. Each time point represented averaged values of 4 repeated experiments. At least 200 cells were analyzed for each experimental sample. Data are presented as mean ± standard error from at the least four independent experiments. Statistically significant differences between treated and control groups were determined by Student's t-test in SigmaPlot. Symbol * indicates significant differences at P < 0.05. Phosphorylation of histone H2AX usually referred to as γ-H2AX, is a well-known marker of DSB, which peaks between 0.5 and 1 h postirradiation. 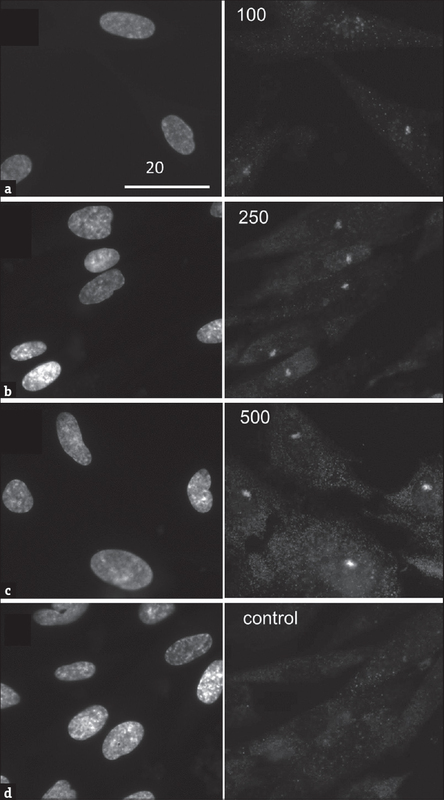 [Figure 2] shows representative images of nucleus targeted cells (N-cells), irradiated with various numbers of protons, and fixed 1 h postirradiation. A bright and very localized fluorescent spot can be seen in microbeam-irradiated nuclei, indicating that cells were successfully targeted and irradiated with the microbeam. It is known that a single DSB phosphorylates multiple γ-H2AX, which can be identified as a fluorescent focus. However, in general with charged particle radiation, DSBs are produced densely along the particle tracks due to the physical characteristic of the ion track structure.,, In addition, increasing number of protons resulted in brighter γ-H2AX fluorescent spots, which indicating that γ-H2AX were induced in highly localized regions equivalent to the microbeam size and proportional to the number of protons used to irradiate the nuclei. 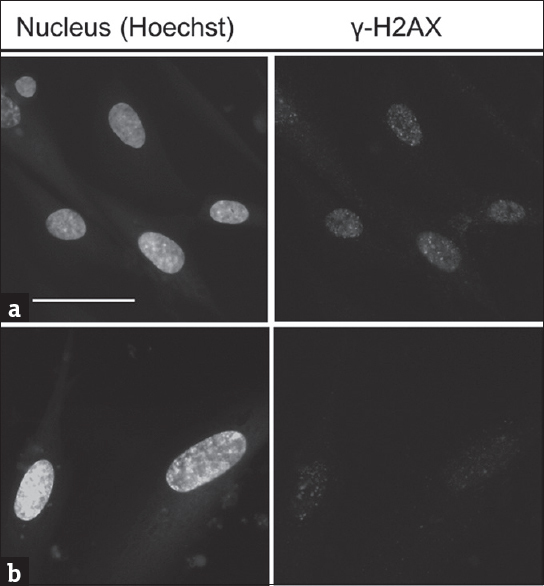 γ-H2AX induction in cytoplasm-targeted cells. A total of 100, 200, 500, or 1000 protons were precisely delivered to the cytoplasm, so that DSB would not be directly induced in cells, due to the absorption of energy from proton irradiation. [Figure 4] shows cells irradiated in the cytoplasm (C-cells) with 1000 protons, and nonirradiated control, fixed 4 h postirradiation. C-cells did not show such γ-H2AX spots that were observed in N-cells and N-C cells, but few γ-H2AX foci which were very similar to the nonirradiated controls. [Figure 5] shows increasing levels of γ-H2AX at each time point after irradiation with increasing numbers of protons. At 1, 4, and 8 h postirradiation, γ-H2AX level showed higher level compared to the controls due to the cytoplasmic irradiation. Especially, 4-h postirradiation, γ-H2AX level showed a drastic increase and was proportional to the number of protons. These results demonstrated that γ-H2AX was not induced directly by the energy deposition by protons, but rather cytoplasmic damage resulted in γ-H2AX induction, as a cellular response. Our studies reveal that targeted cytoplasmic irradiations result in γ-H2AX induction, without direct energy deposition to the nucleus. However, the increased γ-H2AX levels showed a maximum at 4 h postirradiation and not immediately after the irradiation, revealing that the γ-H2AX induction occurred due to cytoplasm damage-triggered cellular response. γ-H2AX levels steadily decreased, and 24-h postirradiation was comparable to control cells. This tendency was observed with both 500 and 1000 proton doses of irradiation. Previously, Tartier et al. reported that the DSB repair protein 53BP1 formed foci in the nucleus of cells irradiated with 20 alpha particles in the cytoplasm. These 53BP1 foci peaked at 3-h postirradiation and decreased 6–18 h postirradiation, consistent with our result. We also showed an increase of γ-H2AX level was directly proportional to the number of protons delivered to the cytoplasm. Pandey et al. suggested that directly irradiated cells show significant changes in mitochondrial protein import, in a radiation dose-dependent manner, that supports our results. However, Tartier et al. reported that the number of 53BP1 foci did not show the difference with the dose of radiation and was equivalent with single and 20 alpha particles. 53BP1 is known to respond to radiation-induced DSBs by quickly localizing to nucleus foci, with the number of foci closely corresponding to the number of DSBs. Since 53BP1 localization can be considered equivalent to γ-H2AX localization, the contradiction between Tartier et al. and our results may arise from the difference in the quality of radiation used in the two studies. SPICE-microbeam delivers 3.4 MeV protons whose LET is relatively small (11.7 keV/μm). On the other hand, the alpha particle microbeam described by Tartier et al. irradiated 3He2+ ions with a high LET of ~100 keV/μm, and the dose of single alpha track is nearly equivalent to that of 10 protons. We surmise that other physical parameters of the radiation, such as particle track structure and microbeam size would induce different degrees of damage that would affect the cytoplasmic damage response. N+C cells did not show a higher level of γ-H2AX compared to N cells, 1 h postirradiation [Figure 3]a. Cytoplasmic irradiation alone showed a slight increase (~10%) in γ-H2AX levels, which was not significant compared to the nonirradiated controls. 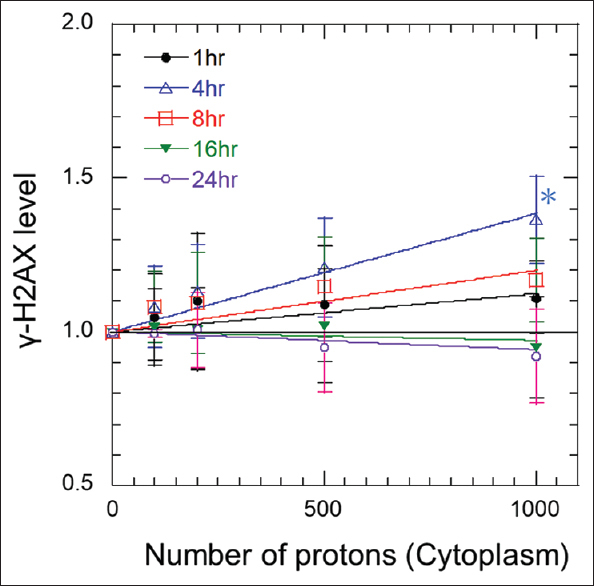 However, N+C cells with 1000 protons delivered to the cytoplasm showed slightly higher level of γ-H2AX 4-h postirradiation [Figure 3]b. This could be due to the cytoplasmic damage-induced DSBs that were detected for C cells. 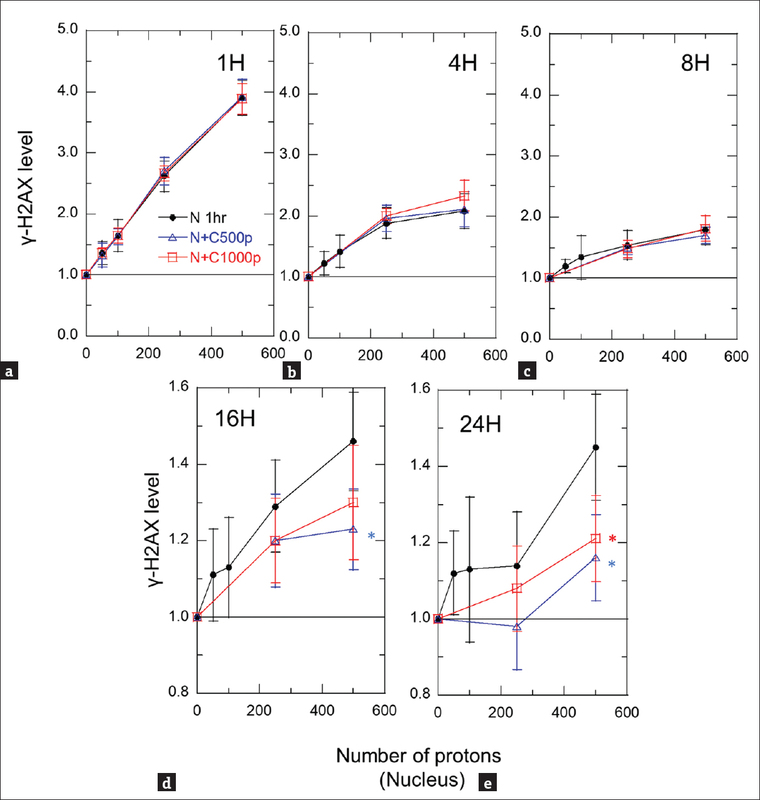 However, we found that 16- and 24-h postirradiation, γ-H2AX levels of N-C cells with 500 and 1000 protons delivered to the cytoplasm, was lower than that of N cells. The cytoplasmic damage response may play a defensive role in DSB repair. Maeda et al. compared the survival rate of only nucleus targeted cells with entirely irradiated cells using PF-KEK monochromatic X-ray microbeam, and reported that nucleus targeted cells showed higher sensitivity to radiation. It is also reported that cytoplasmic irradiation induces nitric oxide synthase activity, increases the level of cyclooxygenase-2 and extracellular signal-related kinase, which are well-known factors regulating radioadaptive response, and commonly upregulated in radioresistant malignant cancer cells. Thus, our results suggest that cytoplasmic damage triggers intracellular signaling pathways to control radiosensitivity. In summary, our studies reveal that cytoplasmic irradiation alone induces DSBs in the nucleus through cytoplasm damage-triggered cellular responses, in a radiation dose-dependent manner. In addition, cytoplasmic-induced damages triggered cellular signaling that enhances DSB repair in the nucleus. Further investigation on the cytoplasmic damage-triggered signaling pathways and identification of the signaling factors, is required. A greater understanding of biological responses would hopefully highlight new intra- and inter-cellular signaling pathways that would be effective for the use of radiation for therapeutic purposes, and radiation-associated risk assessment. Authors would like to thank Mr. Masakazu Oikawa and the staffs of Electrostatic Accelerator section, NIRS for technical assistance on the operation of SPICE-NIRS microbeam. This work was supported by grants from the Japan Society for the Promotion of Science (JSPS), KAKENHI Grant-in-Aid for Challenging Exploratory Research (16K15586) of Japan, and the International Open Laboratory program of NIRS. Zhang B, Davidson MM, Hei TK. Mitochondria regulate DNA damage and genomic instability induced by high LET radiation. Life Sci Space Res (Amst) 2014;1:80-8. Zhou H, Hong M, Chai Y, Hei TK. Consequences of cytoplasmic irradiation: Studies from microbeam. J Radiat Res 2009;50 Suppl A: A59-65. Hong M, Xu A, Zhou H, Wu L, Randers-Pehrson G, Santella RM, et al. Mechanism of genotoxicity induced by targeted cytoplasmic irradiation. Br J Cancer 2010;103:1263-8. Wu LJ, Randers-Pehrson G, Xu A, Waldren CA, Geard CR, Yu Z, et al. Targeted cytoplasmic irradiation with alpha particles induces mutations in mammalian cells. Proc Natl Acad Sci U S A 1999;96:4959-64. Kobayashi A, Tengku Ahmad TA, Autsavapromporn N, Oikawa M, Homma-Takeda S, Furusawa Y, et al. Enhanced DNA double-strand break repair of microbeam targeted A549 lung carcinoma cells by adjacent WI38 normal lung fibroblast cells via bi-directional signaling. Mutat Res 2017;803-805:1-8. Shao C, Folkard M, Michael BD, Prise KM. Targeted cytoplasmic irradiation induces bystander responses. Proc Natl Acad Sci U S A 2004;101:13495-500. Zhang B, Davidson MM, Zhou H, Wang C, Walker WF, Hei TK. Cytoplasmic irradiation results in mitochondrial dysfunction and DRP1-dependent mitochondrial fission. Cancer Res 2013;73:6700-10. Ishihara N, Nomura M, Jofuku A, Kato H, Suzuki SO, Masuda K, et al. Mitochondrial fission factor Drp1 is essential for embryonic development and synapse formation in mice. Nat Cell Biol 2009;11:958-66. Otera H, Mihara K. Discovery of the membrane receptor for mitochondrial fission GTPase Drp1. Small GTPases 2011;2:167-72. Richardson RB, Harper ME. Mitochondrial stress controls the radiosensitivity of the oxygen effect: Implications for radiotherapy. Oncotarget 2016;7:21469-83. Ghita M, Fernandez-Palomo C, Fukunaga H, Fredericia PM, Schettino G, Bräuer-Krisch E, et al. Microbeam evolution: From single cell irradiation to pre-clinical studies. Int J Radiat Biol 2018;94:708-18. Wu J, Hei TK. Focus small to find big – The microbeam story. Int J Radiat Biol 2018;94:782-8. Maeda M, Usami N, Kobayashi K. Low-dose hypersensitivity in nucleus-irradiated V79 cells studied with synchrotron X-ray microbeam. J Radiat Res 2008;49:171-80. Kobayashi Y, Funayama T, Hamada N, Sakashita T, Konishi T, Imaseki H, et al. Microbeam irradiation facilities for radiobiology in Japan and China. J Radiat Res 2009;50 Suppl A: A29-47. Tartier L, Gilchrist S, Burdak-Rothkamm S, Folkard M, Prise KM. Cytoplasmic irradiation induces mitochondrial-dependent 53BP1 protein relocalization in irradiated and bystander cells. Cancer Res 2007;67:5872-9. Wu J, Zhang Q, Wuu YR, Zou S, Hei TK. Cytoplasmic irradiation induces metabolic shift in human small airway epithelial cells via activation of pim-1 kinase. Radiat Res 2017;187:441-53. Konishi T, Ishikawa T, Iso H, Yasuda N, Oikawa M, Higuchi Y, et al, Biological studies using mammalian cell lines and the current status of the microbeam irradiation system, SPICE, Nucl Instrum Meth B 2009; 267: 2171-5. (DOI: 10.1016/j.nimb.2009.03.060). Konishi T, Oikawa M, Suya N, Ishikawa T, Maeda T, Kobayashi A, et al. SPICE-NIRS microbeam: A focused vertical system for proton irradiation of a single cell for radiobiological research. J Radiat Res 2013;54:736-47. Rogakou EP, Pilch DR, Orr AH, Ivanova VS, Bonner WM. DNA double-stranded breaks induce histone H2AX phosphorylation on serine 139. J Biol Chem 1998;273:5858-68. Rasband WS. ImageJ, U. S. National Institutes of Health, Bethesda, Maryland, USA, 1997-2018. https://imagej.nih.gov/ij/. [Last accessed on 2018 Nov 10]. Ohsawa D, Tawara H, Soga F, Galassi ME, Rivarola RD. 6.0 MeV u − 1 carbon ion (C6+ and C4+)-induced secondary electron emission from water vapor. Phys Scr 2013;2013:014039. Konishi T, Amemiya K, Natsume T, Takeyasu A, Yasuda N, Furusawa Y, et al. Anew method for the simultaneous detection of mammalian cells and ion tracks on a surface of CR-39. J Radiat Res 2007;48:255-61. Konishi T, Takeyasu A, Natsume T, Furusawa Y, Hieda K. Visualization of heavy ion tracks by labeling 3'-OH termini of induced DNA strand breaks. J Radiat Res 2011;52:433-40. Pandey BN, Gordon DM, De Toledo SM, Pain D, Azzam EI. Normal human fibroblasts exposed to high- or low-dose ionizing radiation: Differential effects on mitochondrial protein import and membrane potential. Antioxid Redox Signal 2006;8:1253-61. Schultz LB, Chehab NH, Malikzay A, Halazonetis TD. P53 binding protein 1 (53BP1) is an early participant in the cellular response to DNA double-strand breaks. J Cell Biol 2000;151:1381-90.